Join us in welcoming guest author Kevin Carpenter with a dinner review of ‘Ohana. This Polynesian Resort restaurant at Walt Disney World is popular for its all-you-care-to-eat fare served family-style. Aloha! 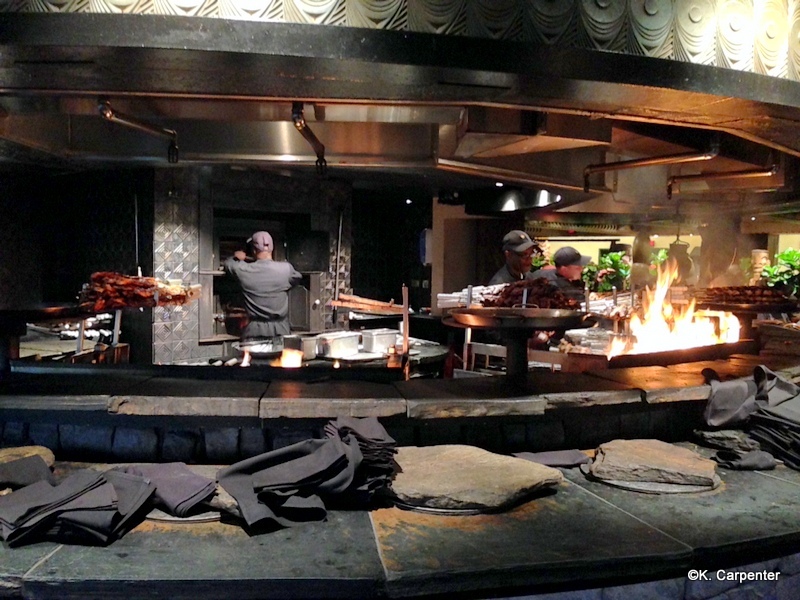 Dining at ‘Ohana is not an experience entered into without expectation. The restaurant regularly claims a spot among the best table-service venues on Disney property and it enjoys word of mouth that is nothing short of exemplary. As such, reservations go quickly. After years of close calls and near misses, I finally secured a dinner reservation – for a party of nineteen, no less – and my hopes were sky high for my first visit to ‘Ohana. As we arrived at Disney’s Polynesian Resort, a large crowd already milled about outside ‘Ohana’s entrance. Seeing this, I feared our large group would be in for quite a wait. After all, our party – extended family members enjoying a Disney vacation together for the first time in many years – was well used to lengthy waits for tables. And this night looked to be no different. We checked in and, much to my surprise, were immediately whisked to our table. I should have known that there is very little the Cast Members of Walt Disney World are not prepared to handle. 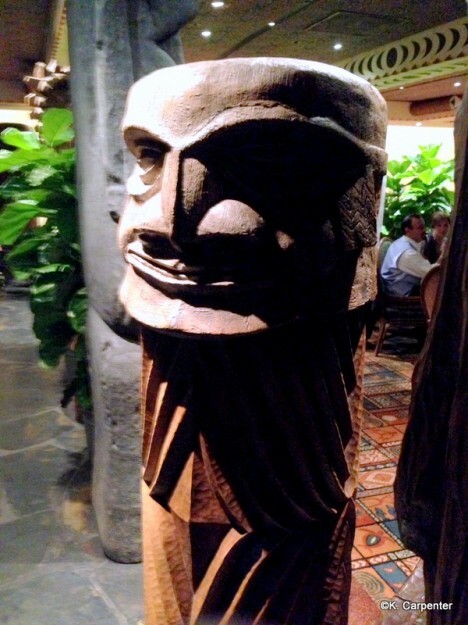 From my very first steps past the Tiki idols guarding the entranceway, I was impressed by ‘Ohana’s ambiance. In true Disney style, the interior theming strikes a fine balance between subtlety and traditional Hawaiian decor. As we reached our long table, one thing became abundantly clear – we had made the perfect choice for our trip’s centerpiece meal. The word ‘Ohana, meaning family, would prove to be more than simply the name of the restaurant. Everything – from the unending salads and appetizers to the main course and dessert – would be served family style. Even the servers are considered honorary “cousins”. What place could be better for a large family meal?! While we had many cousins gathered around our table, it was our server, “Cousin” Candy, who stood out the most. She may have been a member of the family for just this one evening, but she fit right in with remarkable warmth and attentiveness. We had scarcely taken our seats before the table was filled with the incredibly tasty Welcome Bread and bowls of salad with passion fruit dressing. I could have been quite content to savor the bread’s rich tones of pineapple and coconut all night, but the few ‘Ohana veterans among us had warned not to fill up on the bread. Next came plates of honey-coriander chicken wings and pork dumplings. These were labeled appetizers, but they could have sufficed as meals unto themselves. Especially as everything was all-you-can-eat! 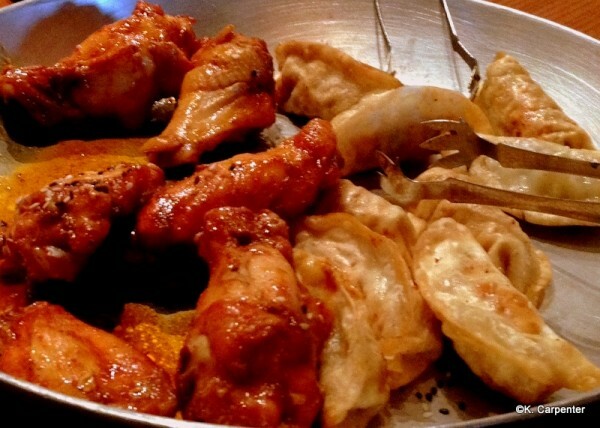 Tangy and delicious, the trays of wings and dumplings demanded refilling several times. Thankfully, my seat at the end of the table afforded an excellent view of the grilling area, where skewers upon skewers of meat and shrimp delivered a firm reminder that the best was yet to come. Several of us requested drinks from the bar, including one who chose to fully immerse himself in the evening’s Hawaiian spirit by ordering the Lapu Lapu. This blend of rum and fruit juices comes in extravagant style – served inside a hollowed-out pineapple. 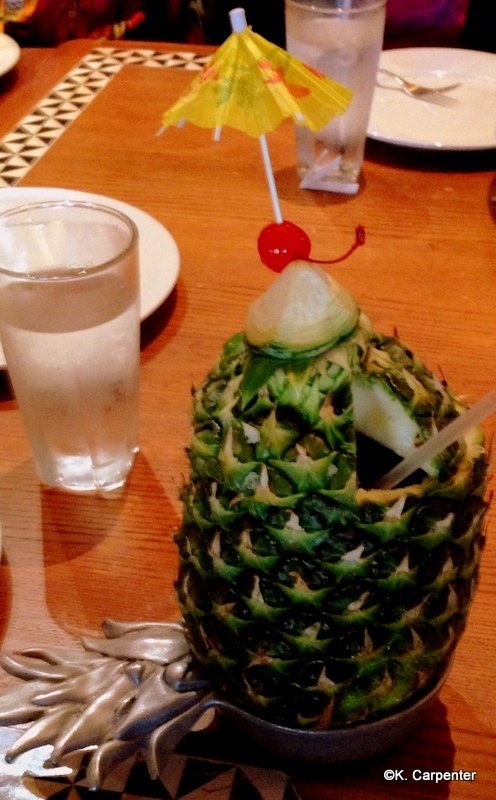 Much to the chagrin of the one who ordered it, the Lapu Lapu made its way around the table as everyone wanted a taste. It received high marks from all who sampled it. And, honestly, our meal just felt that much more traditionally Hawaiian for having the Lapu Lapu on the table! 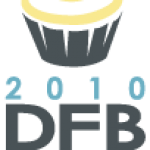 One important consideration to note is that it was not only the size of our party that posed a challenge, but that we were a motley crew of adventurous and picky eaters, with a dietary restriction thrown into the mix as well. One family member suffers from gluten intolerance and required special dietary accommodation. The chef came out to speak with her before any food arrived on the table, and he promised to keep her well-stocked with an assortment of gluten-free alternatives (including gluten-free bread, noodles, and dessert). The ‘Ohana chefs worked hard to ensure that she did not miss out on any aspect of the meal and she could not have been happier with the results. “Cousin” Candy soon delivered bowls of noodles and grilled vegetables that were both cooked skillfully – no heavy sauces or spices weighed down the natural flavors. Finally, the skewers arrived. The grilled chicken came first and exceeded my highest expectations. Mere words seem incapable of describing just how flavorful and juicy the chicken was. 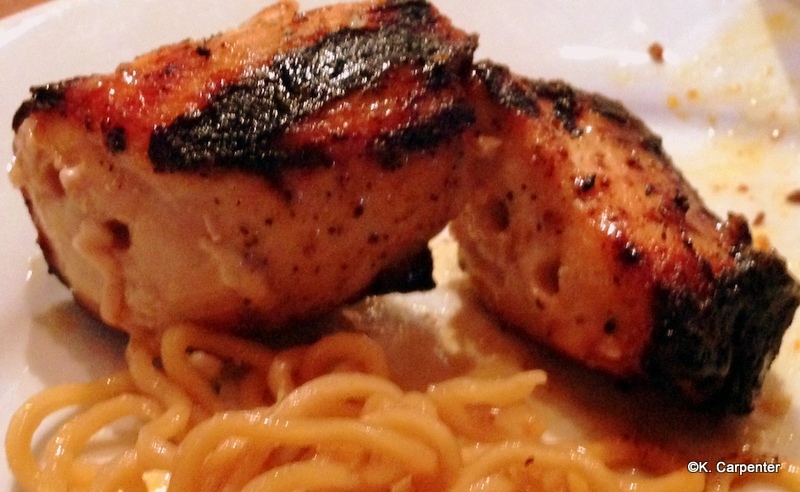 More than one member of the group ranked it as the best grilled chicken ever. The pork loin followed and, although pork is not normally one of my favorites, I am very glad that I decided to give it a try. 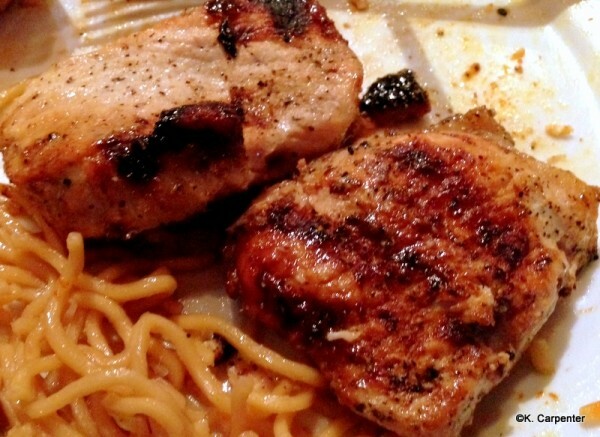 This pork achieved that rare combination of both sweet and tender that just lights up your mouth. If pork always tasted as wonderfully as it did at ‘Ohana, I would be a much bigger fan of the “other white meat”. Yet it was the sirloin steak that I most anticipated … and it did not disappoint. Cooked to approximately medium-well, the steak seemed to melt in my mouth. A few of the ‘Ohana experts among us ate sparingly of the chicken and pork just to save up for the sirloin – it was that delicious! Not being a seafood lover, I bowed out when the shrimp came around – a good decision because I needed a moment to catch my breath and loosen my belt a bit! The shrimp was proclaimed to be outstanding, although a few wished it had been de-shelled before serving. (I mention this only because it was literally the only less-than-glowing comment made all night.) However, considering the amount of shrimp eaten at our table, it was a big hit with our group. In any dining experience where large quantities of meat and vegetables are being quickly grilled, the tenderness and taste of the food can vary from night to night. But, at least on the night of our visit, the ‘Ohana chefs were firing on all cylinders. Incredibly enough, ‘Ohana saves the best for last. Before dessert arrived, I honestly did not know whether or not I could continue eating. But just one glance at the bread pudding a la mode (with accompanying banana-caramel sauce) put a quick end to that debate. 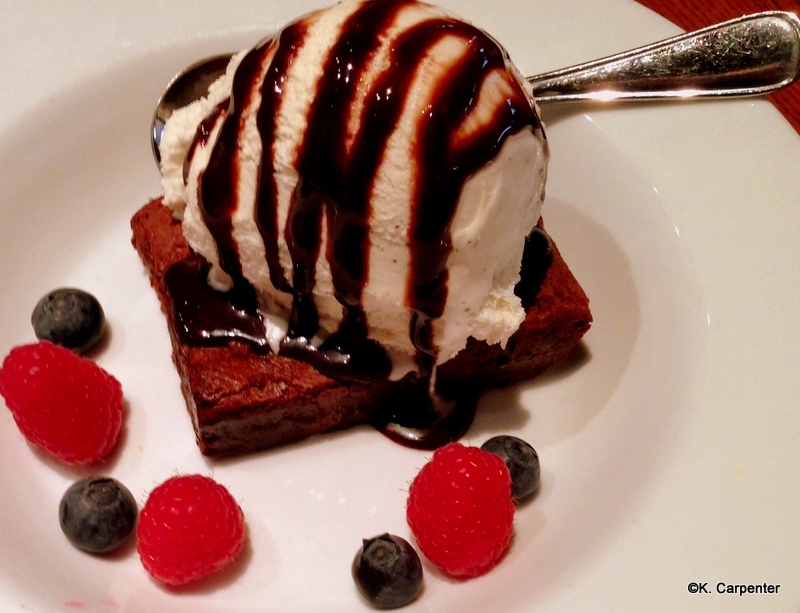 It was the perfect end to the perfect meal. The bread pudding was rich and moist, causing a few voices to pipe up with regret that we could not return another day just to have more dessert. As some finished the meal with coffee (and a few more bites of the bread pudding), I took the chance to sit back and take a good look around the restaurant. Ours may have been a large group of adults (in age, at least, if not maturity), but it was easy to see that the charm and allure of ‘Ohana has no bounds. Children paraded and danced, couples at small tables huddled together to share the romantic Florida sunset, and a bride and groom were toasted by family at a neighboring table. And we were living proof that a large group would be handled deftly. Reflecting back on ‘Ohana, the most important takeaway was that sharing a meal there transcends the food – as delicious as that was. I kept coming back to ‘Ohana meaning family and how that is no small statement. It instead reflects an all-encompassing welcoming spirit, an emphasis on family that drives the entire dining experience. ‘Ohana is an absolute delight, one of those truly ineffable experiences that makes a vacation in Walt Disney World so magical. Kevin first visited Walt Disney World in 1989 and has been studying the life and career of Walt ever since. When not writing, he works in professional soccer from his home in Ohio. You may also find him on twitter at @kejca. Is ‘Ohana one of your family’s favorite dining locations at Walt Disney World? Tell us your thoughts in the comments below! This is an overall family favorite of ours! And thought I am slightly allergic to Pineapple (UNLUCKY ME!) The chef always comes out and warns me what to eat and what not to eat. He even so far as went to the gift shop, bought me Claritin, and brought it to the table (no joke) after I had accidentally indulged on some of that delicious bread! True Disney quality in staff and food, and GREAT for dinner! I agree completely. 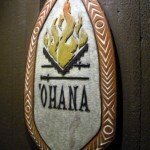 ‘Ohana is one of those restaurants that defines a Walt Disney World trip. In fact I am eating there tonight! I do miss the turkey! But the bread pudding is marvelous! I agree with the only complaint (and it’s my only complaint as well) about the shrimp needing to be peeled. It’s the only food of the night (other than the dry bread) that needs to be touched, thus getting your fingers dirty. As someone who is a big eater, I hate having to work for my food and if the overall meal if a finger free one, I like to keep it that way for the whole meal. It’s a minor complaint in the scheme of things, but worth mentioning. We are headed to WDW early in February with our children, spouses and grandchildren (31 of us). I am so glad we have reservations here! It looks and sounds yummy! I’ll stand up for the shrimp! 2 reasons to keep it on the shell: 1) it adds more flavor when cooking; and 2) it helps prevent overcooking and drying out the shrimp when on the grill. Personally, between overcooked shrimp and messy fingers, I’ll take the messy fingers. I agree Scott! Shell on keeps the juices in and prevents drying out. I’ll take deliciousness over messiness anytime! Thank you Kevin for this latest review on ‘OHANA. My family loves this place but the last time we were there in 2011 the service was slow, the food was super small portions, never re-filled even though we did ask many times for it to be, the turkey was gone, the potatoes we loved were gone, the stir fried veggies my hubby loved were gone, the bread was never served, the dessert was totally different then what we remembered it was mushy and came without ice cream. We had been to ‘OHANA about 5 times before the 2011 trip. It was my favorite restaurant and special to us as we were married at Disney in 2007 and had our first dinner as a married couple there. My parents have wanted to eat here to see what it is since they will never get to go to Hawaii. They saw ‘OHANA on travel channel and wanted to go ever since. So I made reservations for March 21st, 2014. I am praying and hoping it is as wonderful as your experience was. I really think in 2011 our experience was just a fluke that does happen at Disney once in a blue moon. It did leave a BAD taste in our mouth about the place and has kept us from returning. How funny, I came here to check out ‘Ohana reviews and what a surprise this was the first thing to pop up! LOL. I somehow scored a 5:10pm reservations for my fiance and I only 100 days out! This has made me more excited to try it! Kevin, I am glad you had a good experience with your party of 19. Unfortunately, I cannot say the same for our party of 3. 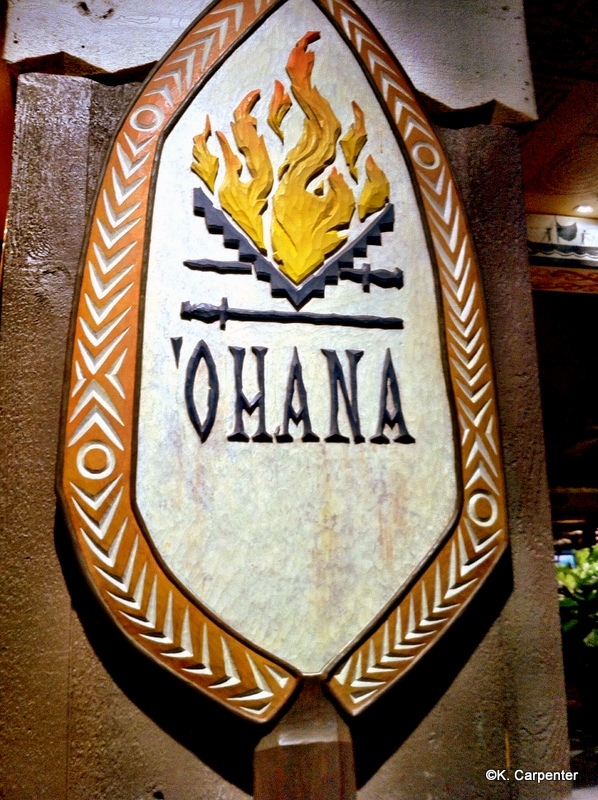 In December 2012 we ate at Ohana twice during our trip (once for dinner and another time for breakfast). We were on the Deluxe Dining Plan (way too much food) and ate at a lot of table service restaurants. The night we had dinner – we were forgotten in the waiting area (yes we had an ADR) after waiting for over 30 minutes approached cast members at podium and was told they thought we had left (we hadn’t). At this restaurant they tend to seat a large amount of parties at the same time due to the entertainment/characters depending on the time you dine. I am glad they are handling food allergies better. I am allergic to cayenne pepper (unusual I know but it does cause anaphylaxis). This threw off the whole rhythm of dinner – they were not sure what I could eat. 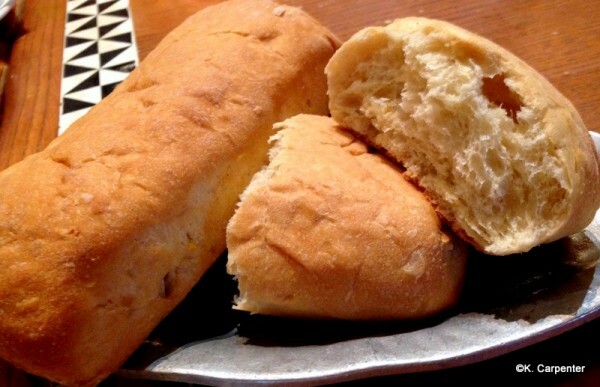 (Normally they grab bread as they seat your party – they skippped that step for my entire party – until they could confirm the ingredients in all food). Due to the fact that we were seated late it – threw the waiter off his rhythm. The dinner never recovered from that point on – which is a shame since this is a favorite of my dad’s and we were so looking forward to this dinner. Before this trip we always told anyone going to WDW that they had to eat at O’hana (Now between our experiences at O’hana and Kona Cafe – I am not sure my Dad will go back to the Polynesian Resort for quite sometime). We thought maybe breakfast would be better (and I was looking forward to Mickey Mouse). However, it was not for some reason our table was not properly set up (2 coffee cups for a 4-top table – no silverware etc.). It took forever to get food (other parties had their food but not us). Then when food arrived we requested a coffee cup (reminder – 3 adults in our party) and silverware so we could eat the now rapidly cooling food. This took awhile and the waitress seemed patronizing. My father walked out of this meal. He had enough! On this trip we were celebrating my 30th birthday – so this put a damper on our occasion. We were able to finally convince my father to come back and eat after we had silverware and everyone had a coffee cup. The manager ended up comping the pictures they take before breakfast ($30). 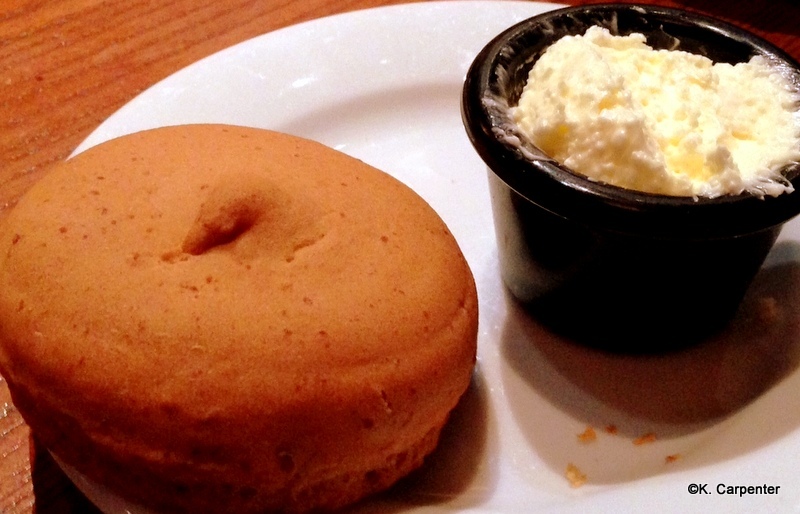 Mickey spent a lot of time with us – one thing that redeemed and otherwise disastrous meal. I am glad that O’hana seems to be better as so many people enjoy this restaurant. However, it will be awhile if ever before I will be able to get my family to go back. We love ‘Ohana. I’ve been many times with many different sized parties and it has always been good for us. Some better than others. But always good, fun, and the atmosphere helps to make it special. Also, a frequent mistake is to call it O’Hana, which makes me smile because it’s not an Irish pub. It’s ‘Ohana. This is one of the BEST reviews I’ve ever read, very well written. I agree 100%. My family has loved ‘Ohana every time we’ve been and the bread pudding is honestly my most favorite food. Funny enough, this review left tears in my eyes at the end. Kevin talking about the other diners as well as the family tugged at my heart. Again, GREAT review! The food is amazing as well as the service. I am always very disappointed at how quickly I get full though and can’t eat everything offered! This will always be our family’s favourite place to eat when at Disney World. This is a must do for us every trip! Even with the changes to the menu over the years I’ve never been disappointed! 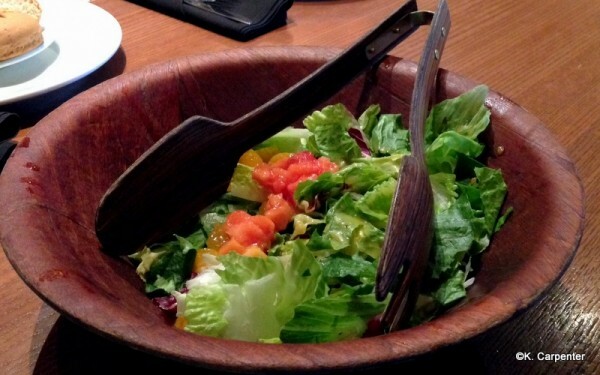 But i did notice that the dressing has changed for the salad which was one of my favorites. Alas it will just leave more room for bread pudding!! Mom and I dined here and we really enjoyed our meal. I am a super picky diner while Mom loves everything. We both felt satisfied after eating. I am especially choosy about meats and I only had the chicken, which was very good and only white meat. I passed on the steak as it was too pink inside and I don’t eat seafood while the pork was never offered to us. My favorite was the salad though and the dressing is Da Bomb! The steamed dumplings were also very good, but I wished the broccoli/veggie mix was cooked more. It was too crunchy for my liking while Mom loved it that way. 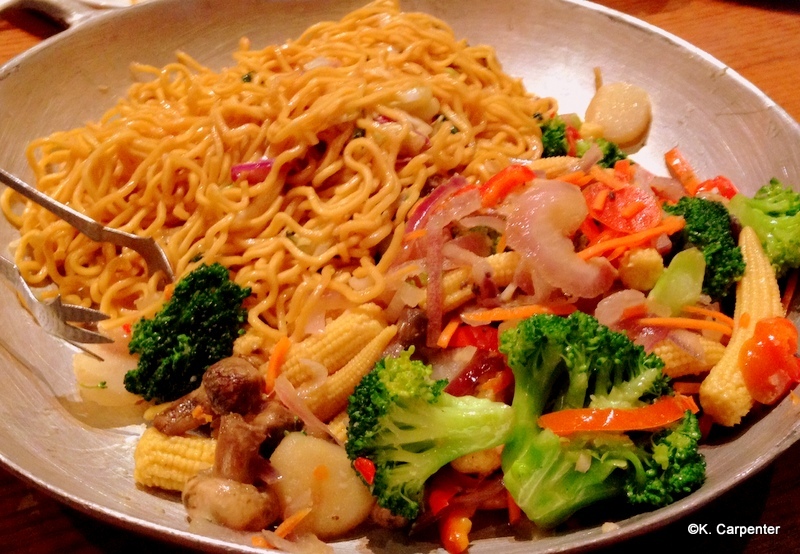 I could have made a meal off the Lo Mein. Yum. The only complaint Mom had was that the shrimp were left in the shell making it difficult and messy to eat. I don’t think they were deveined either. The bread pudding was okay, but we were honestly too full to enjoy it and only had 1 bite each. I didn’t think it was all that impressive and maybe that is because I was already full, or maybe it wasn’t all that, but I like Mom’s bread pudding better. Although we had meals that overall were more artisan, this one had atmosphere, entertainment, and the view. We had a windowside table and watched the fireworks while dining on bread pudding. This was my first visit to ‘Ohana and while it isn’t a 5 star meal, it is good and the overall package with the fireworks included make this a must do for me from now on. I can’t wait to go back with my hubs the next trip to WDW. It was the most fantastic meal my family had at Disney world!!! If anyone leaves hungry I truly feel sorry for them because the food is out of this world and it keeps on coming!!! The desert, well what hasn’t been said already it is the best in the World!! (Disney World that is)!!!!! I tend to think ‘Ohana is a bit overrated — but it IS one of the better on-property restaurants. (The mediocre quality of the on-property restaurants as a whole is an entirely different topic!). That said, I often DREAM about that bread pudding. I wanted to go back there just for that on our last trip, but the rest of my family objected because they thought the food was overcooked when we were there previously. 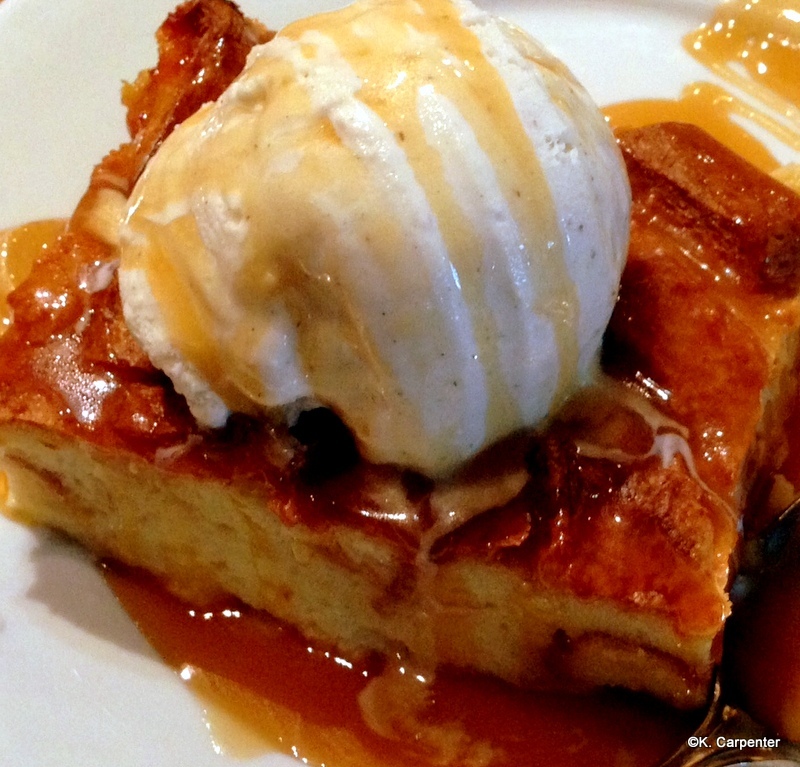 If only I could make that bread pudding at home….but then there would be no reason to go back, right? Love ‘ohana and the poly resort! This is a place we try to eat every trip. Either dinner , breakfast, or sometimes both!! We ate here for the first time in December and it quickly became a firm favourite and we’ll be making to at least attempting to make a reservation for our trip later this year. We love o’hana so much, that twice a year p, we make an o’hana diner at home, waiting to go back there!! I’m glad you had a great meal and a great experience. We’ve stopped going to ‘Ohana because the proteins are usually overcooked and the service is usually sub-par. I don’t like my meats overcooked or my drinks empty. It’s good to know that there are some who can get a good experience out of it. My husband and I LOVED O’Hana when we dined there on our honeymoon recently! Everything was delicious and Cousin Mike kept food coming at a great pace. We even got to slow dance and get leis! One restaurant we’ll be sure to come back to! My family and I ate here on our last trip to WDW. My mom and dad made the trip with us and we all loved it! It’s bittersweet as it was my dad’s last trip to Disney. He passed away unexpectedly on December 22, 2013. I am so thankful that we were able to take our last big family trip to WDW before he passed. I hope that my family and I can go back to ‘Ohana to spend time remembering my dad. On a side note- I was surprised or see how outdated the restaurant and hotel feel. Maybe if we ever go back it may be better next time!! Hopefully. Id love to eat here, but have a couple of questions maybe people can help me with? Firstly is it worth going if you are a vegetarian – I am but my daughter isn’t – would they cater for me? Secondly, if we are just a party of 2, would we have our own table. I am very sociable, but don’t fancy sitting with a group of strangers for a special meal. I had the Lapu Lapu at Kona Café, I’m guessing the drink is the same, or at least similar, it was the best tropical drink I’ve ever had. You could tell that it was freshly squeezed fruit juice and it was very strong, but delicious. Plus, it’s really fun to drink it out of the pineapple! My family LOVES Ohana. Our first time there was June 2013. We have 3 children and all three loved it. Service was great and the food was amazing. We just booked another trip to Disney for June 2014 and be assured Ohana will be the first place we set up an ADR. Great review as well. I’m so pleased this review has been done, we have a trip booked in September and this is on my list as a possibility………this has now been moved to a definite I don’t see how this meal can possibly disappoint me!!!!!! 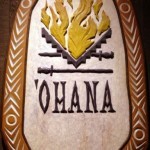 I’ve been to ‘Ohana several times now, and I have never had a bad experience there. It has become the restaurant we choose for our last night of the trip. 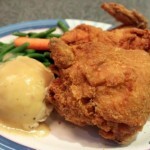 The food is delicious, the servers could not be friendlier, and the atmosphere is nostalgic and amiable. It’s pretty festive, with ukulele music, kids running around playing games with the hosts, and a lot of laughter, but that’s what we enjoy about it. We ate there in October. I have to say that I am not a fan. Not that the food isn’t high quality, or that there is bad service, neither is the case. I am just not a fan of sweet flavorings on my meat. There was plenty of food. It is a very busy place to eat, so don’t expect a ‘romantic’ dinner. We did eat there for breakfast last week, and that is highly recommended. It is also all you can eat, and the menu is scrambled eggs, bacon, sausage, potatoes. There is also a plate of fresh cut fruit (pineapple, raspberries, and melon) and don’t forget the Mickey Waffles! Breakfast there is a lot of fun, and would be on my list to return. children running unattended for at least 45 minutes, 55 minute wait to be seated even though we had a reservation, and then rushed to finish our meal. They charge 10.00 per person if we don’t show, but no form of compensation for their poor planning and overbooking. complained to our sweater who of course had no control, but sent for a manager. The conversation was something like this… you wanted to se a manager? no, I never asked to speak to a manager. please note that I saw this as an attempt to intimate me, since the manager placed herself across the table from me, in with five people at the table who could hear the conversation which was not initiated by me! Another guest walked by me earlier in the evening and said she had been coming their for years and never saw the place in the condition it was in, or the obnoxious behavior of the family with the out of control kids…she was not a happy camper either. Disappointed, like Gail. Ate there on Monday, and sorry that we did. We had read and heard rave reviews. We had a 25 minute wait past our ADR time for a party of 5 (not unusual), and were seated in what I’d call the back-side of the restaurant, near the kitchen. Again, not a crisis had everything else gone even moderately well. From the start, our service was not good. I guess we should have considered our “cousin” to be of the long-lost cousin variety. Drinks easily took 20 minutes. Glasses sat empty for ages. Salad and apps were served quickly and were fine, and shrimp followed immediately afterwards. Then it began… the wait… easily 35+ minutes before we saw any other form of protein, by which point the veggies and noodles were long cold (and no offer of replacement). When it arrived, the chicken was good, but the pork and steak were both over-seasoned and overcooked. We were not checked on to see if we wanted or needed anything else. To remove our plates, the waitress stacked all of them on our table (from all five seats) like one would at a diner, scraping off food remains and slopping together our dirty utensils. Not what I expected here. After another 15+ minute wait dessert appeared, but there was no inquiry about coffee or anything else, and a request for a decaf went unanswered until we stopped another “cousin” to ask for some help. I have long given up on hoping for anything more than nicely staged mediocrity at most Disney restaurants (agree with Jenn above on that point), but I have to say that based on this one experience I am stunned at the kudos that O’Hana earns. Now I’m torn… do we give it another go and expect something different (and are we throwing good money after bad if we do), or just move on to something else? If it was clear that this was just a bad experience with one cousin, it would be an easy answer, but our experience seemed to also reflect on some greater problems than those caused by one server. We did bfast using our Disney plan and I would have to say it’s the worst so far in our meal plan experience. The choices are limited and the serve staff was too few for the amount of people there. One bright thing was our server ms Desiree, she was good but over worked with lots of table that the service was long. Overall me and my family will not be dining in ohana for bfast again. I made a reservation for Christmas Eve, the only one available was at 9:50 pm. We arrive there at 9:30 pm and were told there were table available and it was not going to be long, well we waited until 10:20 to be seated. Then the worst service started, they were in a hurry and piled the food on our plates, so we can shove it down our thout, because they were tired and wanted us to finish soon. 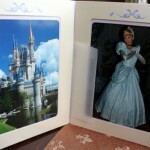 We decides to go there looking for Disney Magic and definitivelly did not find it, very dissapointed. Also, food all tasted the same, everything was sweet, even my 15 years old notice it, and at that age they eat everything. Very dissapointed!! We (party of 6, 4 adults, 1 tween and a toddler) ate there on Feb. 1, 2015 at 8:10 pm. Worst 2 hour experience ever. Food was cold and over cooked, the pork was so dry it was uneatable. Service was horrible. We watched guests who arrived after we did get there food, eat and leave while we waited to be served. We wanted to complain at the time but there didn’t seem to be a manager on duty and we did not want to wait another 2 hours to see if a manager was available. Ohana means family and this is not how you treat family. At least the fireworks show kept the kids entertained for a few minutes. I would definitely not recommend this restaurant. Ohana’s is our favorite restaurant at WDW. There’s no way I can single out any one food item. It’s ALL incredibly awesome! Saying simply that I would recommend it would be an understatement. We had a late 9:20pm dinner reservation on 7/17/2017. Other than a few shining moments, the dinner was an utter disappointment. Let me say that we have been to WDW each of the past 6 years and have had many meals. Not much ruffles my feathers but this experience nowhere near approached the expectations I had. First, the good. Dumplings and shrimp were very good. I’m not a sweets person, but the bread pudding was unique and satisfying. The not so good. The chicken skewers were raw. 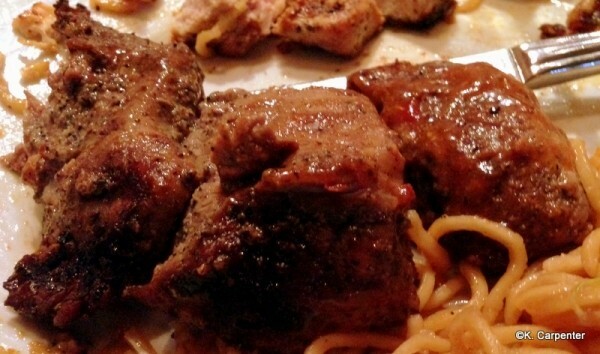 When the meat does not pull from the bone, it is not cooked sufficiently. Fine. I came more for the steak and shrimp, right? The steak skewers were as tough as horse meat. I’m mean raw as raw can be. I could not cut through the meat. I showed the server and asked for alternate pieces. When these were just as raw, I asked if he could locate some medium to well pieces. Try as he did, the server came back not with edible steak but with excuses. I was embarrassed in front of others at my table as I had told them in advance how coveted reservations are for ‘Ohana and how they will love the experience. I left thinking how bad the food was especially for the premium I paid and thought, perhaps there was some justification. Like, maybe 9:20pm is one of the last reservations before they shutdown for the night. Maybe the cook was rushing each coarse. But in the end, there was no redeeming qualities to this meal. It felt like I was at a cheap buffet where quantity trumps quality, except this was not cheap. It pains me to write such a review as I’ve heard such great things about ‘Ohana. It was that bad that I don’t know if or when I could give it another chance. Too bad, because we loved staying at the Poly.